I look forward to worshiping in the Cathedral with the certainty that I am worshiping in an Episcopal Church. I hope that the Cathedral Chapter lives into its decision and continues to be a house of prayer for all people. A difficult decision, to be sure and a difficult tension in which to live into - being The Episcopal Cathedral and remain committed to be a welcoming place where everyone can worship, including the opportunity to "host" the ACNA "should they choose to use our facilities for future events". There are often tough choices as we live into the Gospel. If they can remain hospitable to those who have left the church, they will be a shining example to us all. No doubt Bishop Duncan will find another of his exclusive ¨Places to Stand¨ on the well-being of LGBT Christians/others at Church...so be it but in the meantime let the Church doors be flung open to the marginalized, the despised the least amongst us...all of the least amongst us. One simple correction for now. The vote was the final item of business, after which the meeting adjourned. There was no "walk-out" by ACNA chapter members, as the meeting was already over. If the Special Resolution did indeed fail, this is at least part due to the enduring distrust between the two dioceses, to which leaders in both have contributed. Given what actually occurred on Thursday - about which more later - I fear this will not be the end of the matter. I'm sorry the experiment failed. A Cathedral open to groups in many other ways antagonistic to each other was an intriguing idea in welcoming all. I wish the vote had taken place after Christmas, though. I wonder how many are like PoO and only now feel welcome since the Cathdral declared sides and how many will no longer feel welcome for the same reason. I sometimes wonder if that's why non-denominational churches are growing in areas that mainlines are shrinking. Perhaps people see them as welcoming to more people because they don't have to belong to a national identity. Since I was not present—neither was Jeremy, I might add—I do not know exactly what non-Episcopalian voters in the Chapter meeting did after the vote. The vote, however, effectively ended their tenure on the Chapter, as it reaffirmed Episcopal Church membership as a prerequisite to Chapter membership. I always believed, like virtually all the Episcopalians with whom I discussed the matter, that the fence-sitting embodied in the Special Resolution was untenable. I do not know how the Special Resolution came to be, but it always struck me as arrogant, rather than irenic. With every other parish having to choose one side or the other, why did the people of Trinity Cathedral think that they could simply declare that their situation deserved a special dispensation? The dual-cathedral arrangement went on as long as it did because the status of the Cathedral was a sideshow to the larger ongoing dispute over property. Both dioceses wanted the cathedral, but it was in the interest of neither to press the issue. Diocesan property issues are now settled, however, and the disposition of parish property is being determined on a case-by-case basis. The status of Trinity Cathedral was bound to come up sooner, rather than later. I was not present but I have heard from those who were. What is tragic is not the outcome, but the way the process for reaching it seems to have been mismanaged (for which I'm not blaming Lionel, though I'm not sure that I feel as charitable toward Bishop Price). All our discussions over the past few years (and I've been a member of Chapter for much of that time), have only incidentally been about property. I hope the TEC Diocese realizes the "asset" they've just gained; every indication is that there will now be a significant loss of pledges from ACNA members for which our current budget doesn't allow. All too soon we'll be back to either draining the endowment or drawing a diocesan subsidy - I hope St. Paul's and Calvary are up to the challenge. Ironic that this should happen just twenty-four hours before the judicial ruling in Quincy. Interesting to find one judge who believes that "reasonable persons could draw different inferences from the undisputed facts." I doubt anyone ever truly believed that the Special Resolution and joint governance could be a "permanent" solution to the status of the Cathedral following the division of October, 2008. Nonetheless, I have appreciated the creativity and sincerity of those in both dioceses, and most especially in the Cathedral congregation itself, who have worked so hard to make it work. I remember sitting with Wicks and Pam Stevens on that evening in the late fall of 2008 when the reorganizing Episcopal Diocese had its first informational meeting at the Cathedral following the diocesan division and wondering just how that congregation would be able to survive in the season ahead. I'm sure they will survive, of course--though as Jeremy correctly points out it is going to require some heavy lifting in our Episcopalian neighborhood. Sustaining a viable "downtown" congregation is a very challenging task, and "rebuilding" one would be ten-times more difficult. There aren't many examples out there. In any event, I would have to say that on a personal level I feel a good deal of sadness, as this awkward cohabitation at Trinity was one of the few lingering remnants of the life we once shared together. I think it would be a best-case scenario that the Cathedral could continue to offer expansive hospitality to our Anglican Diocese friends at least in offering the Cathedral as a liturgical center--though I would understand if that might be a challenging offer to accept. 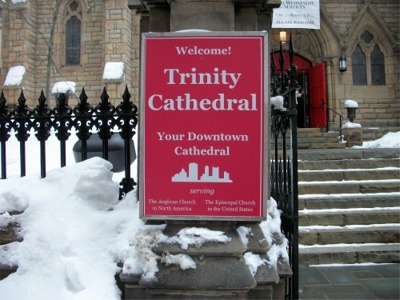 I attended Trinity Cathedral yesterday, and I can report that there is no evidence that the cathedral is trying to run off those who consider themselves part of ACNA. The environment seemed welcoming and caring, and the liturgy—this might surprise some—was first-rate. The sermon was thought-provoking, and the medium-sized choir was excellent. Only the size of the congregation was disappointing. Pittsburgh Episcopalians need to support what is again their cathedral. Yes, this will be a challenge, but the symbolic value of a downtown cathedral is enormous, particularly if it can be seen as making an essential contribution to urban life. Pretty ceremonies, nice music, not many people-that's pretty much modern Episcopalianism/ Mainline Protestantism right there. Lionel, it was great having you with us Sunday. Glad you were blessed by it. Per your earlier exchange with our resident historian Jeremy Bonner... My wife was at Chapter and confirms Dr. Bonner's account. Most if not all ACNA members remained through the adjournment, and some continued in conversation following--a dialogue which even extended to the parking lot as a member of the Executive Committee of Chapter conversed with +Price. There has been some assumption that those who may leave the cathedral as a result of this action would do so solely out of allegiance to one diocese or the other. I wanted to give you and your readers the perspective of an Episcopalian who has had to leave. I have been at Trinity for fifteen years, through the final years of Dean Werner’s tenure, the painful transitions and financial crisis that occurred thereafter, the calling of the current Provost, and the institution—and now ending—of the Special Resolution. For the last six years I served on the on the Chapter. I was a fervent supporter of the Special Resolution, and dreamed that such an arrangement might materialize even before it did. I have a strong personal conviction that the concept of broadly serving both sides is a non-negotiable part of the catholicity of Trinity’s, (or any cathedral’s), mission. So, first and foremost, I have had to resign as a result of the outcome of this vote. Was the Resolution irrational, awkward, and untenable, as many have described it? Sure it was, but in my mind it was the right thing, and the only thing, to do. Secondly, my resignation was necessary because my continued presence would lend legitimacy to the procedure itself. Within the text of the Special Resolution, there are specific majorities of both the parish-elected members of Chapter and the parish itself, which had to be attained in order to un-do it. When the Resolution was passed three years ago, it was enacted and ratified almost unanimously by both the chapter and the parish, and all who voted for it had every right to believe that they would again have the opportunity to vote to retract it if that became necessary. This is not what happened. A resolution was crafted in secret and put forward for a vote at a chapter meeting wherein no one except the resolution’s crafters were aware it would be offered, did not exclude non-parish chapter members as the Resolution required, nor, apparently, will there be any parish vote as also required. The supporters of the new resolution claim their premise is that the Special Resolution was in conflict with our charter and by-laws and therefore was never legal to begin with. Therefore, the Special Resolution’s own provisions cannot be quoted with regard to these majorities. Could they be right, technically? I suppose. But the will of all who overwhelmingly enacted the Special Resolution is being trampled by a small minority that wished to dispatch it as expediently as possible. I think of the moving image of Ted Kennedy leaving his death bed to vote for health care reform. When a decision as momentous as this is imminent, it is only ethical that all chapter members would have been informed. Some may interpret my departure as sour grapes, but nothing could be further from the truth. For fifteen years I sacrificed a lot for Trinity, in terms of time, talent and treasure. I regret not one bit of it, nor do I wish for any of what I gave to be returned. All of these things were given to a cathedral that was doing the right thing, and therefore I rejoice in having done so. When the cathedral determined to cease doing the right thing—however rational that decision may have been—and through such unethical means, I had to cease supporting it. Thank you, David, for the link. I have commented on the responses from both dioceses here.